Action Carting was sued for the 2011 death of Mark Chenko, an 83-year-old Korean War vet. GREENPOINT — The private garbage company whose driver fatally struck a cyclist recently has a history of safety problems, including killing four other pedestrians and injuring at least a dozen others since 2008, according to court records and reports. New Jersey-based Action Carting, the city's largest private garbage company which has been lugging waste since 1999 and picks up garbage from more than 16,400 private restaurants, offices and companies across the city, has settled a handful of cases in which its drivers have struck and injured people. The carting company also pleaded guilty and paid fines for 20 safety violations Friday, according to court records. An unidentified driver for Action fatally struck 27-year-old Neftaly Ramirez, a bar back at gourmet pizzeria Paulie Gee's while turning right on July 22 at Noble Street from Franklin Street in Greenpoint. The driver fled the scene, but police later tracked down the truck. No one had been arrested as of Monday morning, police confirmed. "Action Carting is cooperating fully with this ongoing NYPD investigation, as it does with all accident investigations," the company spokesman Ken Frydman said. This wasn't the company's first deadly crash. Action Carting was behind the 2008 death of cyclist Timothy Campbell in East Williamsburg near the intersection of Varick Avenue and Meserole Street where the driver fled the scene, the Brooklyn Paper reported. Also in 2008, two English tourists Andrew Hardie and Jacklyn Timmons were killed when an Action Carting truck jumped a curb when the driver suffered a seizure, the New York Times reported. Then In April 2011, a driver with Action backed over Mark Chanko, an 83-year-old Korean Veteran who was walking behind the vehicle on York Avenue in the Upper East Side, according to a police report. The driver remained at the scene and no one was arrested, police said. His widow Anita Chanko, settled with the company a year later, court records show. When Chanko heard about the fatal crash in Greenpoint, Action Carting jumped to mind, she said. "When I heard this on the news, my first thought was I bet it’s Action," she said. "I hope this will be the final blow that these people will finally be taken down." At the time of her husband's death, the safety cameras on the dump truck were disabled and a worker who was supposed to be guiding the truck backwards was halfway down the street picking up trash, she said. Beyond at least five deaths, Action Carting faces lawsuits by more than a dozen pedestrians and drivers injured less severely when hit by the company's trucks in collisions across the city, court records show. Pedestrians Joseph Cohen, Iyenoma Ogbebor and Jakwan Riddick were all hit by Action Carting trucks, according to three lawsuits dating back to 2010. In August of 2015, Andrew Tolston's leg was mangled by a truck that blew through a red light on the Upper East Side, according to a pending lawsuit, though the police report conflicted with that account, saying that the truck had the right of way. Tolson, who admitted he had been drinking, walked into the roadway near the intersection of 88th Street and Lexington Avenue, and the garbage truck tried to swerve away from him, police said. A review of criminal court records shows that the company's drivers face at least 20 recent cases for traffic safety violations in Manhattan. Two open cases on file show the company owes $300 in fines. Last year, Action Carting partnered with the city to add safety measures that would prevent cars, pedestrians and cyclists from sliding under the trucks. The company's CEO Ron Bergamini sits on an advisory board of the Business Integrity Commission, the agency that licenses carting companies in the city. But at a May meeting of the commission, where two earlier deaths caused by drivers of private garbage trucks were discussed by board members, Bergamini was absent, according to board minutes. Frydman said that the CEO had a conflict that evening and could not attend, but was aware of the meeting and briefed afterward. Board members talked about adding lights and new safety technology to trucks and about drivers and pedestrians distracted by cellphones. Frydman said that Action has an ongoing safety training program for its drivers. 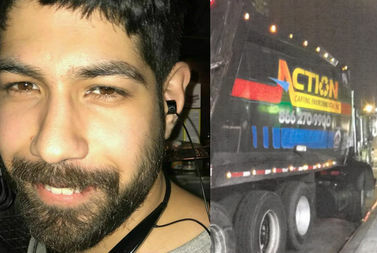 Ramirez is the third death linked to a private dump truck in three months, and comes amid mounting scrutiny of how commercial waste is collected. Sophia Aguirre was killed when the car she was riding in was rear-ended by a Avid Waste System dump truck that sent her car careening into a pole on April 29. Sixty-year-old Fern Jones was killed by a garbage truck owned by M&M Sanitation while she was crossing West 8th Street on May 17. In the current system, private companies collect commercial waste with no specific routing system, meaning trucks from several different companies could fetch garbage from the same city block, snarling truck traffic and worsening air quality in their wake. Last August, the city pledged to spend the next two years developing a plan for a new system of commercial waste pickup using collection zones, instead of the current random system.